Looking for Brian Gill's Ultrasound Reviews? All of my latest reviews and ultrasound training videos are now hosted with my employer Providian Medical, where one of my key jobs is to evaluate and compare ultrasound equipment, as well as advise our sales staff on the best equipment for the price. My Reviews can be found on the Providian Medical Blog. There, you can find more than 150 training videos and reviews of many different ultrasound machines. Please check out all my latest stuff there. I've been very busy over the past 6 years at Providian providing more frequent content on the latest ultrasound machines. Unfortunately I don't have time to write reviews for all the ultrasounds that pass my desk, and I realize that it's likely that you're here for one reason: you want help with a tough and expensive purchase. "Dear Brian, I am an XXXXX and I am considering XXXX machine. Do you think I'm choosing the right machine or am I way off-track and should choose something else?" Does this sound like you? You're not alone. So I've built a free solution for you. It's easy for me to update and easy for you to view. 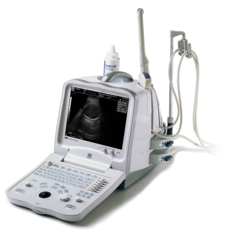 It's a list of the Top Portable Ultrasound Machines for sale. It includes systems from the usual suspects: GE, Acuson, and SonoSite, but also some surprises like those from SIUI and and SonoScape that I haven't mentioned yet. Sorry Philips, I don't think you'll make this list until you make something that's reasonably priced. I'll update this list of my reviews on best portable ultrasounds and it will have the latest and greatest based on what I've seen and what customers say about what they've purchased. GE and SonoSite have really done a great job in the market, but some new competitors have introduced incredible price/performance that I can't resist putting on the list. Stay tuned as I build them for other modalities and applications. Let me know your thoughts in the comments and if you have any suggestions for other modalities! At first, I can't say I loved the M-Turbo. However, the more I used the system I found how much I really liked it. 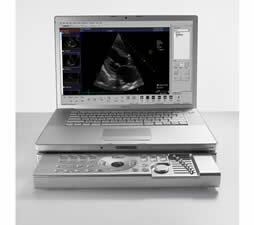 The image quality is outstanding, and like its siblings SonoSite MicroMaxx and SonoSite Titan, it's very easy to use. This video review of the M-Turbo covers its strengths and weaknesses. Key strengths are its image quality, durability and ease-of-use. Its simplified user-interface makes it ideal for physicians who use an ultrasound as a tool for a quick diagnosis or to provide guidance for a procedure. Nearly all the M-Turbo systems that I sell go to a physician. Typically these physicians are in an orthopedic, anesthesia, or pain management field. It is a good upgrade to the SonoSite MicroMaxx, however, the M-Turbo's price can be a bit out-of-reach for smaller offices. In such a case, the MicroMaxx is an excellent solution, as well as other systems such as the Mindray M5. Give me a call to find out which is best for your particular situation 866-347-7633. At the time of this writing, SonoSite was just purchased by FujiFilm. So who knows what to expect in 2012 and beyond for SonoSite's products. I would expect to see more of the same with developments for these products. 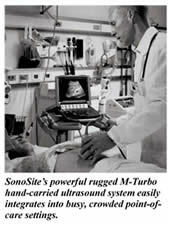 I have no concerns about warranties or support for the M-Turbo or other SonoSite ultrasounds. We sell a lot of these units and there are plenty on the market for parts and service to be available for at least 10 years. Yes, 10 years. We still service systems from the late 1980's! Additionally, these products have been so popular that the market will continue to see more refurbished/used SonoSite ultrasound systems, which also means that prices will drop as more hit the market and newer systems are released. Enjoy the video, leave me a comment if you have questions or just tell me what you think and what else you'd like to see here. I've updated the Mindray M5 video with some new images that better demonstrate IP (Image Procesing), iClear, and iBeam... as well as demonstrating the latest software revision. Disclaimer: These are not created in a clinical setting... I scanned myself in these images with a probe in one hand while the other adjusted imaging controls...so for those who ask "can I get images like you have in your video?"... the answer is a resounding YES. The idea is to provide you with real-world images rather than the unlikely images you'll find in standard marketing materials. In short: great system for a great price. In the M5 units we've sold, the overwhelming response is that it's an overachiever; customers are very pleased with the quality and performance they received for the price. It's easier to use than I'd expected, and the image quality makes it a serious competitor in the price/performance category. Think: new system, competitive performance for the price of a refurbished system in its price range. It's well-worth the price for nearly all markets. For cardiac, the price of this unit makes it hard to pass up. Important note: The images you see are not clinical nor marketing images from some unrealistic lab setting. They're created in poor conditions yet provide impressive results. These are scans of my carotid as I was testing the system... and creating this review was an aftertought (I was sitting upright while holding the probe and manipulating the controls with the other hand). And because the conditions weren't ideal, I felt they were perfect examples of the MIndray M5's ease-of-use and its ability to provide great imaging with little-to-no effort. In fact, these images were part of a training video I created for this system. You can get a free copy of this M5 training video when you purchase the system from GPS Medical. It's the only training video available on this system, and it's only available through GPS Medical (and it's free). With the purchase, you also receive free applications support. I've spent many hours delving into the depths of this system and you'll have a direct line to me. These are freebies that are not available through any other vendor. Easy 3D is not so easy! Beware of cheap marketing ploys on your ultrasound system. For example, one of the most common requests is to get an Easy 3D package on their ultrasound, such as many of the GE Logiq ultrasounds, Logiqbook XP, and others. This is not 4D. It is not easy. EASY 3D is not 4D, and it is NOT EASY. This is one of the more requested features for those looking for a budget 3D/4D ultrasound. It is a relatively useless feature and tremendously frustrating. It is really 3D ultrasound version 1.0, in which you have to manually sweep the probe. One movement, breath, anything will create a horrible image, and you have to manually render and cut the image. It's maddening and I tell people to pretend it's not there. This is not a ploy to sell you a Voluson, iu22, P5, or X300 ultrasound with 4D. Really. Easy3D is not good for your "babyface" stuff if that's what you're looking for. Maybe it's not fair to call it the Acuson P10, but 2 years ago Siemens offered something very similar to GE's recently FDA-cleared handheld ultrasound device and to say it's been successful would be a great exaggeration. But this unit with its iPod-like interface may be different. The unit gets an incredible "WOW" factor because of its size and potential. However, as with the P10, in theory it's an excellent idea that would provide doctors with a great tool for diagnoses when time and portability are critical. In reality, unfortunately common sense does not always prevail. The problem? Reimbursements. A doc or hospital isn't going to be tremendously excited about buying something they can't bill Medicare for... particularly when you can get a slightly larger ultrasound, such as the SonoSite Titan, Mindray DP6600, or GE LogiqBook XP for a few bucks more... AND there are no strings attached when billing for usage of these machines... which makes it a potential profit-center or break-even deal. Sure it's a great tool in tough situations for exams such as abdominal, cardiac (adult and pediatric), urological, fetal/OB, pediatric, and thoracic/pleural motion and fluid detection. GE Healthcare is finally releasing the much awaited Vscan pocket sized ultrasound. Many in the industry hope that this device offers a chance for physicians to make a move from stethoscopes to portable imaging devices, bringing advanced visualization to any examination room. The unit weighs one pound and is only 3 inches (7.6 cm) wide and 5.3 inches (13.5 cm) long, offering both standard black and white imaging, as well as colored blood flow doppler. GE is touting Vscan's size and capabilities for cardiologists to transthoracically view myocardium, pericardium, and heart valves, and for primary care physicians, as well as OB, ER, and others, to scan the liver, kidney, aorta and peripheral vessels, babies in the womb, and anything else the transducer can penetrate. LogiqBook XP: Hidden Optimization Tip! If you have a GE LogiqBook XP portable ultrasound machine, it's likely that you're not using one of the most common image-optimization functions found on ultrasounds today. The feature is Tissue Harmonic Imaging. It's advertised in brochures, but there's NO BUTTON on the keyboard to show you how to activate it! It's odd, yes, and I've found nearly ALL users I speak with don't even know it's there. Press CTRL and H at the same time and see what happens. We're listed in the top 50 sonography sites! The Web Health blog just announced my blog is in the top 50 sonography sites available on the web today. I must say this is a nice way to finish the year for us! Free Ultrasound Machine Reviews and Tips: Brian Gill is the President of GPS Medical, Inc., a company specializing in sales and service of diagnostic ultrasound equipment with specialties in 3D/4D ultrasound techniques as well as evaluating image quality and ease-of-use of various ultrasound models. 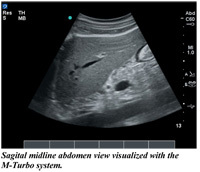 M-Turbo ultrasounds are now available on the used equipment market with the balance of the warranties (5-year) transferrable to the end user and an extremely competitive price. In most cases, this would be about 3-4 years of warranty remaining. You'll pay a fraction of the price, which starts at $25,000. There are few available, but the price is a fraction of the cost new. 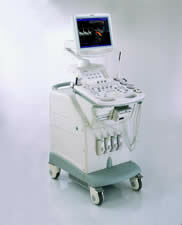 Visit our ultrasound specials page for more information. The title says it all. Through the end of the year only. Call us for info. The Voluson 730 Pro BT08 is now available at an all-time low price with Demo (perfect) probes. Starting at $32,500. This is the latest revision. See our Specials page. Today I need your help. I'm finishing production on a training video for the Voluson i that ships free with the systems we sell to end users. I'd like your input! The videos are free knobology/system overviews that are a visual training for our customers new to the system. It is NOT diagnostic nor is it intended to be. I've done applications training on many systems over the years, but I'm always learning from my customers and experts like you. Do you have any suggestions on things you would like to see in the basic user manuals or applications training done by professionals? The audience here is a user who is new to the system, and not new to ultrasound. This could be your favorite imaging tip/hint/secret, annoying things to avoid when teaching, tips for physician training, tips for sonographer training, or important advice for learning a new system. Because it's a DVD, I can't tailor it specifically to an end user (ie: put in the context of the system it's replacing). If I use your suggestion and it's not already included, I'll send you a free copy of the Voluson i video when it's done! Email me your suggestions, and thank you all! Get my latest ultrasound equipment reviews, ultrasound news, and other ultrasound related content on Twitter! A team of professional radiologists voted that the largest threat to radiology is the use of medical imaging by physicians. We have seen a tremendous demand from physicians in anesthesia, endocrinology, vascular and vein, surgery, pain management, family practice, orthopedics, rheumatology, and many other specialties, whom are adding ultrasound to their practice in order to become more efficient. In addition, they're finding that the reimbursement adds revenue to their bottom line, and saves their patient money (as opposed to the costs of sending the patient to a hospital or imaging center). Physicians get results on-the-spot, "point of care" results and can make a quick diagnosis. For more information on ultrasound in your practice, give me a call and I can help you find the best ultrasound... such as SonoSite, GE, or Siemens portables. "Look at this," the anesthesiologist said to his colleague, "it'll give you a good idea of what you need to see when you're performing the needle-guided injection." The doctor had just pulled out his iPhone. But not to make a call or show a picture of a family. He was showing a demonstration of a complicated medical procedure on an app called SonoAccess from SonoSite. It's iPhone app designed for point-of-care physicians to learn and visualize the many new and emerging applications for ultrasound. I had the app, too, but hadn't taken a look at it. However, I had just finished training these six anesthesiologists at a local hospital on the SonoSite MicroMaxx portable ultrasound. In the training, we weren't able to do an injection on a live patient, so he pulled out this cool little iPhone app and "wowed" his audience. Obviously, it's no replacement for practice, but it allowed the doctor to provide a good visual of this ultrasound procedure. I delved into it more and thought I'd share my thoughts here. Overall, the app is easy to use. On the first load it asks you for minimal contact information, then you're in. It opens to the "coach" section, which is tailored to the preferences, or "specialty" that you set up in your profile. The videos are separated by specialty and product. It provides some cool training videos on their products, which are typically a better, visual version of their quickstart guides (also found on the app in text form). However, getting to the videos isn't entirely intuitive. Say you're going to take a look at a video in the "coaches" section... to get there, you'll click on the bottom-left icon that says "coach". Find the video that you want, then click on it. On the left, it shows as a picture of the video or a generic, unspecified document with text describing what you came to see. There's no "click here" or anything of the sort. So, to get to the video, just click on the image or text and you'll get what you need. Not all videos are created by SonoSite, although a good portion of them are. And it appears not all images in the videos are SonoSite machines in use. Some of these videos are provided by a cool site called SoundBytes. This site, while it states it is subscription-based, also allows you to view free informational videos on various ultrasound procedures. They're informative and helpful videos that are wonderful to help in identifying structures, issues, and landmarks. There are videos on tendons, lower and upper extremity, DVT, pelvic, echo, and many other applications. The next icon on the SonoAccess app takes you to "cases", which also links to many videos and articles on ultrasound scanning. The videos are helpful, however, many of the documents are quite difficult to read on the iPhone. They're PDF files that are also available on SonoSite's website, and you can look into the SonoSite Virtual classroom. It's much easier to read the documents on a larger computer screen than pinching-and-scrolling on the iPhone. It hurts your eyes. The SonoSite virtual classroom can be frustrating to navigate, but you'll eventually get what you need. The next icon takes you to "images", which is quite self-explanatory. It's a good resource and saves the effort of running to a computer and evaluating case-studies. In fact, these ultrasound images and videos are quite convenient for those moments in-between cases when you're not quite sure when you'll be needed. You can view them anywhere so long as you have an internet connections (videos and images are downloaded from the internet, not stored on the phone itself). The last information icon is "guides." Again, while the information is helpful, it's really tough to read on the iPhone. These are PDF files that are already available at SonoSite, so you're really better off looking at them there. It can be really frustrating pinching-and-moving the screen to try and view the document in a font that doesn't require an eagle's eyesight. These guides include some good information, so don't ignore them. There are very good resources that SonoSite provides on its ultrasound machines (including quick guides), and ultrasound reimbursement info, which seems to be information that is hard-to-get oftentimes. Note that the reimbursement info is based on the national unadjusted physician fee schedule, so it will just give you a good idea of what to expect. There's also good information on these pages regarding other fees and procedures. Overall, an excellent app that is stable and very informational. SonoSite really stepped ahead of the other manufacturers here by allowing its vast research and resources to be available to the general public. Nice work. Get it here. SonoAccess Ultrasound iPhone Application Features | SonoSite Inc.
Scanning Techniques The Scanning Technique Videos are designed to provide expert techniques and tips for point-of-care ultrasound applications. The Quick-Start Guides are abbreviated user manuals designed to give new SonoSite users a digital roadmap of their system's controls and features to help navigate the user interface. This is an interesting, long article written for the Harvard Business Review discussing the future of ultrasound and how GE is "disrupting itself". Its initial focus discusses the success of "reverse innovation" in ultrasound. Its a somewhat ironic situation in which equipment designed to meet the needs of less-developed countries with less resources, are being introduced to the larger, more well-to-do countries for entry in the market place. And they're finding success. ie: Their emerging markets find places in our emerging markets, but a tad bit differently. In the first paragraph, it discusses two ultrasounds that refer to its recently released GE Venue 40 Ultrasound Machine series. 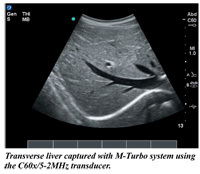 The Venue series of ultrasounds are direct competitors to the SonoSite S-series ultrasounds, but apparently at a much more competitive price point. They're singular-focus ultrasounds designed to be used as a tool to assist another procedure, and largely designed for physician-use. For GE, these include: Vascular Access, Anesthesia, Interventional, Musculoskeletal, and Point of Care ultrasounds. Frankly, when I do apps training on these types of limited-use portables, I don't like them as much. Sure, they are easy to use, but they're hard to optimize and, oddly, frustrating to some. I prefer the Siemens P50 because they're more versatile and you can use a wireless mouse. I find that many physicians choose the SonoSite systems simply because its all that they've seen (ie: great marketing on SonoSite's behalf). Don't get me wrong, I really like SonoSite ultrasound machines, but each has its place. Venue 40 ultrasound Product Brochure and information found here. But I digress. Here's the article. It's important to note that all of the authors are on GE's payroll, including Jeffrey Immelt, CEO of GE Healthcare. Its other authors are Vijay Govindarajan, and Chris Trimble. The remainder of the article is very interesting but less ultrasound-focused. It essentially discusses how GE will use innovation for less-developed countries as its model to compete in the worldwide market (note that these countries, such as rural India and China, are some of the largest emerging market in the world). It states that if GE does not innovate for these countries, the smaller "giants" of innovation will crush GE. In May 2009, General Electric announced that over the next six years it would spend $3billion to create at least 100 health-care innovations that would substantially lower costs, increase access, and improve quality. Two products it highlighted at the time—a $1,000 handheld electrocardiogram device and a portable, PC-based ultrasound machine that sells for as little as $15,000—are revolutionary, and not just because of their small size and low price. They’re also extraordinary because they originally were developed for markets in emerging economies (the ECG device for rural India and the ultrasound machine for rural China) and are now being sold in the United States, where they’re pioneering new uses for such machines. We call the process used to develop the two machines and take them global reverse innovation, because it’s the opposite of the glocalization approach that many industrial-goods manufacturers based in rich countries have employed for decades. With glocalization, companies develop great products at home and then distribute them worldwide, with some adaptations to local conditions. It allows multinationals to make the optimal trade-off between the global scale so crucial to minimizing costs and the local customization required to maximize market share. Glocalization worked fine in an era when rich countries accounted for the vast majority of the market and other countries didn’t offer much opportunity. But those days are over—thanks to the rapid development of populous countries like China and India and the slowing growth of wealthy nations. GE badly needs innovations like the low-cost ECG and ultrasound machines, not only to expand beyond high-end segments in places like China and India but also to preempt local companies in those countries—the emerging giants—from creating similar products and then using them to disrupt GE in rich countries. To put it bluntly: If GE’s businesses are to survive and prosper in the next decade, they must become as adept at reverse innovation as they are at glocalization. Success in developing countries is a prerequisite for continued vitality in developed ones. The problem is that there are deep conflicts between glocalization and reverse innovation. And the company can’t simply replace the first with the second, because glocalization will continue to dominate strategy for the foreseeable future. The two models need to do more than coexist; they need to cooperate. This is a heck of a lot easier said than done since the centralized, product-focused structures and practices that have made multinationals so successful at glocalization actually get in the way of reverse innovation, which requires a decentralized, local-market focus. Almost all the people and resources dedicated to reverse innovation efforts must be based and managed in the local market. These local growth teams need to have P&L responsibility; the power to decide which products to develop for their markets and how to make, sell, and service them; and the right to draw from the company’s global resources. Once products have proven themselves in emerging markets, they must be taken global, which may involve pioneering radically new applications, establishing lower price points, and even using the innovations to cannibalize higher-margin products in rich countries. All of those approaches are antithetical to the glocalization model. This article aims to share what GE has learned in trying to overcome that conflict. We just dropped the price on refurbished units of the SonoSite MicroMaxx and the SonoSite Titan portable ultrasound machines. These have been popular with needle-guide applications (PICC line, anesthesia, pain management, etc) as well as Musculoskeletal applications lately. Of course, we also sell them for the traditional uses such as vascular, breast, emergency department, and other ultrasounds typically performed by the Physician. You can also just call for pricing on the MicroMaxx and Titan. We just added the full range of Acuson Antares (Siemens Antares) transducers to our available inventory. We sell these new with warranty and also have used probes available. We have a special price on the C5F1 4D Antares transducer, as well. It's a great resource to add or replace your transducers. All links may not be up yet, but they're all available if they're listed on the Antares page. Click on the contact link to get pricing. We're still getting a lot of buzz around the Acuson Antares (Siemens Antares). I'd forgotten about it so I'm posting it here. Acuson X150 video coming shortly. Email Brian Gill if you're interested in knowing more about this system or if you're interested in adding it to your practice. You can get more information on the Acuson Antares at the GPS Medical website. Additionally, GPS Medical is selling replacement transducers for the Acuson and Siemens Antares ultrasounds, new and refurbished, with warranties. A new report confirms many things we've discussed here for a long time: adding revenue through ultrasound is not just viable, it's becoming a necessity for many offices. 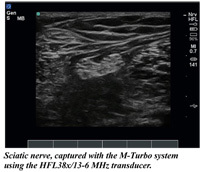 I've long been a proponent of the use of the Hand Carried Ultrasound, portable, laptop sized machines, for use by physicians and non-traditional settings such as endocrinology, rheumatology, MSK, anesthesia, bedside, critical care, podiatry, emergency medicine, and other such non-traditional ultrasound environments. It's become increasingly popular and it's why we like the Acuson P50 (which we just highlighted here), GE Logiq e, GE LogiqBook XP, SonoSite MicroMaxx, and other such portable models. This report confirms it, you can find the full article here. The full report will cost you an arm and a leg, but for my purposes and those who read this blog, the summary should suffice. The image quality found on today's portable ultrasounds rivals many current console units, and surpasses many of those that cost more than $200,000 just a few years ago. Additionally, for the full consoles or portable ultrsaounds, the costs of refurbished ultrasound equipment have dropped significantly in recent years, bolstered by the fact that competition on used ultrasound market market increases. Our take: if you're looking at refurbished ultrasound, make sure they have a service department and the salespeople actually know what they're talking about. If you're spending $10,000 or $100,000, doesn't it make sense to spend a couple extra dollars to ensure you're getting the correct machine and that it's refurbished properly? We've built a successful business on that model. If you're looking to add ultrasound, this report confirms that it's going to continue to grow, and emerging markets continue to explode worldwide. We've found that for most physicians, it's an excellent additional revenue source in an increasingly more difficult market... and it's cheaper, easier, and takes less space than CT or MRI. Marketstrat is pleased to announce the release of its latest market report titled, "Medical Ultrasound Systems Worldwide, 2009." Acuson P50 revision 2 shows large improvements in image quality for cardiac and vascular applications. This past week, we received our demo version of the Acuson P50 portable ultrasound system. We were excited to finally see this unit, and we took some images with revision 1 and revision 2 Acuson P50 ultrasound machines. I'm putting the images together and will have side-by-side images on the blog shortly. The major change in Revision 2 is the addition of SieClear spatial compound imaging as well as important cardiac imaging improvements ... ie: image quality in cardiac is much improved. We'll post these images later this week. SieClear is the Acuson/Siemens equivalent of technologies such as CrossXBeam (GE) or SonoCT (Philips/ATL). When it's added to SieVision (Speckle Reduction), imaging of tissue and vessels is much improved in revision 2. Additionally, one of the main issues in the past was the image quality in the cardiac applications. Revision 2 is definitely an improvement on penetration and overall image quality. We compared revisions on cardiac, as well, and there was definitely a very solid improvement, particularly in color Doppler, penetration and wall definition. We like it MUCH better over the first version of the P50. Stay tuned for some carotid comparison images. Physicians have a great opportunity in the midwest for a hands-on ultrasound workshop here in the Midwest. Siemens will hold a few different workshops in midwest cities in which you can learn about, and practice using ultrasound in basic and emerging technologies. These have been great workshops for Physicians to see some of the newest technologies, learn more about advancing the use of their own ultrasound... and how to expand the use of their own ultrasound, providing more services for their patients. Additionally, it's common for non-ultrasound using physicians to get a close-up look, including hands-on use, giving them a good idea of whether ultrasound would be good for their practice. Workshops will feature the newest Acuson ultrasound machines, as well, some of which I've featured on this site and the GPS Medical site. All classes are sponsored and taught by Siemens. Workshops are just 3 hours long with one-hour of hands-on use after the workshop. Interested? Email me with your location and I'll pass along the correct contact information for your area. You can also leave a comment here. EDIT: I was informed that space is limited and filling up in some sessions. If you have ANY interest, contact me ASAP and I'll get you a spot. It baffles me as to why such a strong product, the Acuson Cypress, would be taken out of production. We're down to the last units available... probably forever. A decision made by the higher-ups at Siemens cancelled the production of this long-time legend in the portable cardiovascular ultrasound market. It's being replaced by the Siemens P50, which is a great system in its own right, but the Cypress is quite solid and its imaging capabilities are really fantastic for such a small system. We've gone to so many offices in which the Cypress is so highly regarded by the staff and Physicians... and it's such a small, fun little thing. Does it have its quirks? Of course, all portables have SOMETHING that had to give, but mobile companies simply love it, and our service department loves it more. They just don't break unless it's something of a user-inspired issue (dropped probe or system). This unit is one of the easiest sales we make. It sells itself, the price is good, and it has Stress Echo, DICOM, IMT, and all sorts of goodies. Penetration is good for cardiac, as well. If you like this system, buy it now. Call us, there are literally very few left (like, less than 50) 866-347-7633. We are an authorized distributor and you'll get the real deal with the one-year warranty. Don't sit on the fence, they will be gone. No joke. We have no control over this, nor do the lower-end powers-that-be at Siemens. After that, you'll need to get the very capable (and better) Siemens P50, but the price will be higher, and not by a small amount. RIP Acuson Cypress, we really loved you. Funny thing, I bet you'll be more expensive on the refurb market than you are as new. See you there, my friend. You will be missed by all. We've just updated our specials page as new equipment has rolled in and we're dropping some prices to move them quickly. We have more than what's listed, but these are the best deals of the bunch. Check out our specials page to see what's available. Don't see what you want? Call at 866-347-7633 and see if we have it. Legislation has been introduced into the U.S. House of Representatives that would close a loophole in federal law that enables physicians to self-refer patients for imaging studies as long as the exams are performed in their own offices. The so-called Stark law in-office loophole has long vexed radiology advocates who see it as a way for nonradiologist physicians to skirt the law's provisions banning physicians from referring patients to entities in which they have a financial interest. Imaging proponents believe physician self-referral is driving higher imaging utilization and, thus, higher healthcare costs. But the Stark law loophole would be closed under legislation introduced by Rep. Jackie Speier (D-CA), whose Integrity in Medicare Advanced Diagnostic Imaging Act of 2009 (HR 2962) would amend Title XVIII of the Social Security Act to exclude certain advanced diagnostic imaging services from the in-office ancillary services exception to the Stark laws. The laws would ban in-office self-referral of modalities such as MRI, CT, and PET, but would not cover x-ray, ultrasound, and fluoroscopy studies. It would also not cover imaging services performed for the purposes of radiation therapy treatment planning or in conjunction with an interventional radiology procedure. In addition, it would not cover nuclear medicine exams apart from PET. The bill currently has no co-sponsors. It has been referred to both the House Energy and Commerce Committee and the House Ways and Means Committee. The Acuson Antares ultrasound surprised us with its 4D capabilities and confirms that manufacturers are finally able to compete with GE's excellent line of Voluson 4D ultrasound machines. In fact, the Acuson Antares provides a more versatile machine than what you'd get out of a Voluson, and provides excellent image quality while doing so. We still like the Voluson a lot for its 4D, but this is an excellent consideration when looking for something that will fit your budget and provide much of the same 4D functionality that will be appropriate for most uses of 4D ultrasound. The bonus is that it has a very good cardiac package as well. 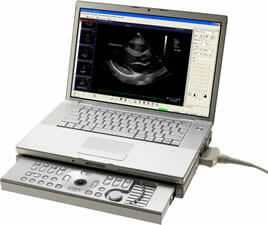 The Acuson (Siemens) Antares 4D imaging is also very similar to what is found on the new Acuson X300 ultrasound. We have a video coming in the next few weeks that will take a look at the X300 and give you an idea of what it looks like and what it can do (although we did not get a chance to do 4D with it). You can view our Acuson Antares 4D ultrasound machine video here. It will also be posted to YouTube in the near future and we'll post the video here when it's all done. Please don't hesitate to write me if you have any questions or if you'd like more information on the Antares or any other ultrasound machine. We know what we're doing. Our latest quick video of ultrasound equipment is here. We reviewed the Acuson X150 and the video will give you a good idea of how it functions, what it looks like and an idea of how easy it is to use. Correction: Apparently, there's not a bi-plane transducer at this time, for that you'd still need the G20. By the time you read this, however, it's possible the probe is available. Call me at 866-347-7633 if you have questions. In a nutshell, it's no secret that ultrasound has come a long way and it's often hard to tell the difference between some of these. The Acuson X150 has a very easy user-interface and is rock-solid. It follows in Acuson's tradition with a commiment to the long-lasting platform that addresses techs and physicians needs. I spoke with the engineers and apps people at Siemens and they're relieved/excited to have a new, solid product line that can, once again, sell itself. We took a look at the Acuson X150 and the above video is a quick synopsis of its ease of use and outstanding quality. It's a mid-range system at a low-range price. With solid color Doppler, harmonic imaging, easy-to-use interface, and overall excellent image quality, this is EXCELLENT for small-mid size offices performing OB/GYN, Endocrinology, musculoskeletal, anesthesia, vascular, venous, abdominal, breast and many other applications. It's perfect for physician use and is easy to learn and use. Here's a quick video I made of the Terason t3000 so you all can see it as well. By no means is this a comprehensive video of its features. I may do that at a future date, but with all the questions I've received, I felt it was important to show just how easy this machine is to use.... it also shows the sliding console and the fact that the "box" is removed from the probe cable. This is my first time posting a video to the site, so I'm testing it here. Let me know if you have troubles viewing it. There's a great line in the movie Philadelphia in which Denzel Washington says "Explain it to me like I'm a 6-year old". It's been going through my head since Saturday. I spent some time in the office this weekend, and my inquisitive 8-year old daughter wanted to see what an ultrasound could do (besides 4D babies). I was going over an ATL HDI 5000, Voluson 730, and wanted to spend time with the Terason t3000 I'd received just a few days prior. I told her I'd show her the inside of her body if she was interested. After spending time on the other two units, we came to the Terason. "No, but close. It's an ultrasound." I replied. "You mean like those big things?" she referred to the HDI 5000 and Voluson 730. "Yeah, but this one is better," I said as I pressed the side keys to release the ultrasound console in a hydraulic-like fashion. Hearing her reaction, I stood up straighter, smiled broadly, and was really proud... well, for all the wrong reasons. You see, daddy's work just got a lot cooler and, well, it felt great for daddy's ego. Five minutes prior, we spent time watching her carotid artery and jugular... listening to the vein and artery and watching the blood flow through them in all their red and blue glory. Sure, this was cool to her and very educational... but the James Bond ultrasound was a quadruple-"a" "Awesome". Brushed aluminum and things that slide from nowhere are, apparently, much cooler than anatomy. WhatEver! So it was time to push it a little. I wanted to see if she could figure out this Terason... I figured that if she can figure it out, it's unlikely that a physician new to ultrasound will struggle. I asked her to turn on color Doppler. Her finger hovered above the "C" on the console, then she looked at me, not scared, but unsure. I told her to go with her instinct. She pushed C and up came a color box. Unafraid. This is important folks. She smiled. A REALLY big smile. I was proud for the right reasons this time. I looked at my wife and said "I wish I had a video camera, but I doubt anyone would believe this is her first time using this." Of course, while I'd like to think my daughter is the most brilliant kid on Earth (duh, she totally is).... the point is that the Terason is NOT THAT HARD. I realized that Terason got this right. Yeah, I'm a nerd for being excited, but when trying to sell something to a person who's never used an ultrasound before, EASE OF USE is nearly as important as Image Quality. Frustration leads to bad studies and inefficiency. That's not good when you're driving a needle into someone's body. So I told my daughter that I wanted to hear her carotid, and she'd need to turn on Pulsed Wave Doppler. She looks down for two seconds and tentatively presses PW. Excited and intrigued, I walked over to the Voluson i we have in-stock, and saw the softkey buttons in different locations; what I once thought was cool (Voluson i) became frustrating and overcooked ... its user interface is just like the Logiq i and Vivid i. I walked back to the Terason: It's elegant. Not perfect, but elegant and functional. Nice. We stepped over to a Vivid 7. I looked down and didn't want to crush my daughter's now-lifted ego. I didn't need to ask her. I turned it on and before I could say anything, she said "I don't think I can do this one, daddy." Maybe its size was intimidating, I don't know. I imaged her heart on the short axis and told her: "This is what your heart would like if I cut you in a half with a light saber." OK, so I lose the "dad of the year award," but it was really funny at the time. Techs enjoy consoles. I enjoy the console, and the Terason console is really great for a compact HCU (hand carried ultrasound). But today's market is growing rapidly in the Physician area and I think they'll be like my daughter: Totally comfortable with the Terason because it feels friendly and is friendly. Techs will be the ones who might be a little more tentative at first, while Physicians will likely be relieved. The console serves both sides well. This unit is simply an extension of the PC (When you boot the system, you get a Windows XP desktop, and you can run it completely from the keyboard if you choose). The console is very functional with fewer softkeys than the GE. It's labeled well and acts like any other PC application (because it is a PC application). However, just as if you're coming from any cart-based system: remember that there's only 12-inches to work with, not 24. Things need to be compressed. Get a console if you want a console. If you need portable, you're remiss if you don't call Terason. Clearly, SonoSite understands this as well, they've taken most of the buttons OFF their machines that are going to physicians. GE adds more. Philips doesn't have anything. Terason one-ups the latestby using the common, most user-friendly (and coolest) PC on the market: The MacBook Pro. In the coming week I hope to get a video out on this system and post it for you. I'm also going to do an update on the Portable Ultrasound Market. SonoSite's new products, the t3000 release (Siemens licensed version that will be the Acuson P50), and some rumblings about Zonare have begun to tilt this market in new directions (FINALLY!). Next week I'll be at the RSNA conference in Chicago through Tuesday. If you can't make it and have any questions for the vendors or would like my opinion on any new or old products, send me an email and I'll try and help out. I have a few meetings and will be looking very closely at Ultrasonix, as I haven't had a good look at its equipment yet and I've heard great things about their product. I'll also check out ZONARE and new products from the big three at GE, Siemens, and Philips. I will also spend some time with the DICOM software maker ASHVA and checking out its iMagic DICOM software. This looks like a pretty solid product for those who are looking for a simple DICOM solution that includes solid reporting features. Drop me a note at my gmail address if you would like my thoughts or any information. The best ultrasound deal ever? This morning I was speaking to an old customer who is looking to do some ultrasound screening. She wants a great image but a low price (who doesn't?). All she needs is a stationary machine. Normally, you think about some of the newer stuff that's come out.... and I've been so focused on what's new in the industry, that you forget how good a price some of that old stuff is right now. Just a few years ago, the ATL HDI 5000 with SONOCT and XRES was, arguably, the best imaging machine for vascular, OB, GYN, and small parts. 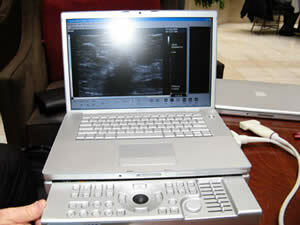 Then its successor came out: the Philips iU22, as did a whole slew of Windows-based ultrasounds. So, these new consoles with USB ports, more ergonomic consoles, 4D, and DVD writers made the whole industry go "OOOOH" and "AAAHHH" over these cool new toys. However, the image quality wasn't a night-and-day improvement over the old stock.... only the operating system and ergonomics were the major changes. So what happens to the old powerhouses? The hospitals that are addicted to getting the "latest and greatest" are trading in their perfectly good ATL HDI 5000 systems with outstanding image quality to get these ergonomic, flat-screened "wow factor" windows machines. And now, our industry has a ton of these HDI 5000 systems. This is the time to buy one. Their image quality rivals most systems out there, you can get DICOM and incredible imaging quality for, quite literally, 10-20%% of what you would have paid just 5-6 years ago! It's so bad, that some manufacturers are actually sending these to the recycler if they're not the top-of-the-line system (ie: SonoCT and XRES), they give no trade-in value and simply send them to a recycling company. Yes, there are that many out there, and you should be taking advantage of it! If you are looking for an ultrasound and you want to turn a profit quickly, you should really take a look at the HDI 5000. It's drawbacks? Well, it's an older user interface and it's a bit slow when you want to change the probes or modes. We're talking a couple seconds here, not 5 minutes. It transfers to the network quickly and can save images in DICOM format... this was the industry leader just a few short years ago! And what about service? These things are easy to service and parts are getting cheaper all the time. Outfits like my company have tons of parts for these machines and they're not going away any time soon. To toot our own horn a bit, the GPS Medical service team is loaded with experts on these systems, and we can even repair the monitors and circuit boards for these! Call us today at 866-347-7633 to get a quote. Tell us what you'll need to do, and chances are you'll spend under $30k for a loaded ATL HDI 5000 ultrasound with image quality that rivals systems that cost more than $100,000! One of the coolest sites on the internet, HowStuffWorks, recently released a visual tour of How Ultrasound Works. I'd skip the visual tour if I were you, it's quite boring, contains 183 images, and includes many images of outdated equipment with few good details. However, there's a fantastic article (from which those images are derived) for those who are looking to get into ultrasound... such as those in the emerging markets of internal medicine, emergency medicine, and Family Practice physicians who are looking to add ultrasound to their practice. It gives a great background and overview of understanding the principles and what you need to know about these great devices. You can see the whole article here. There are many reaons to get an ultrasound. Perhaps you are pregnant, and your obstetrician wants you to have an ultrasound to check on the developing baby or determine the due date. Maybe you are having problems with blood circulation in a limb or your heart, and your doctor has requested a Doppler ultrasound to look at the blood flow. Ultrasound has been a popular medical imaging technique for many years.